This is the kick-off to Black Friday and holiday shopping season. 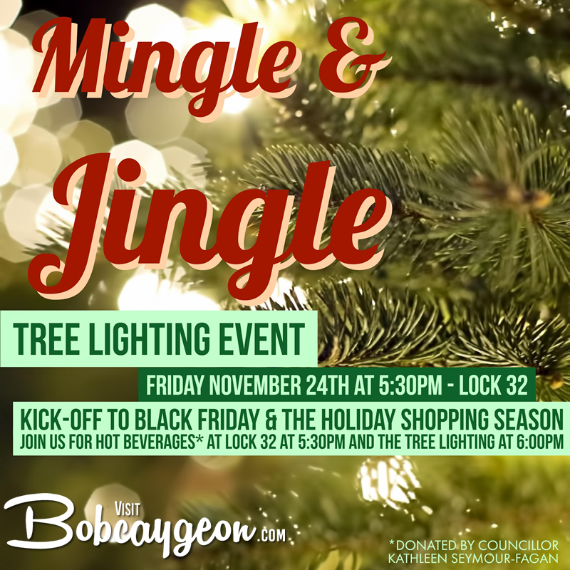 Join us for hot beverages (donated by Councillor Kathleen Seymour-Fagan) at 5:30pm and the Lock 32 tree lighting at 6:00pm. Bobcaygeon businesses will have Black Friday sales throughout town. For businesses planning to have extended hours on Friday November 24th, 25th, or 26th, we have created these posters in 8x11 and 11x17sizes (click size to download pdf), promoting the event. There is a space at the bottom of the poster for you to include your extended hours details. Please feel free to download the poster and print it for your door, window or retail counter.